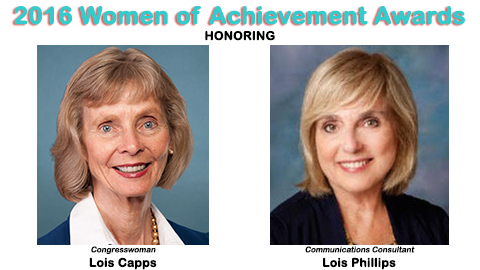 Congresswoman Lois Capps and Communications Consultant Lois Phillips will receive the Women of Achievement Award from the Association for Women in Communications, Santa Barbara Chapter at a luncheon on June 3 at El Paseo Restaurant. The 2016 theme, “Women Stand Up, Speak Out,” fits both these leaders in many ways. With a name bestowed upon a plethora of wonderful women, including Superman’s award-winning journalist girlfriend, the honorees had a lot to live up to. They stood up to the challenge with gusto. Both Loises grew up during a time of great social unrest. They witnessed the civil rights, women’s and environmental movements emerge into profound forces. The turmoil they observed affected them as they married, became mothers and forged careers. Yet they never predicted the directions their lives would take. Later in life each developed a public voice in their respective leadership roles. Each Lois influenced the way people think and effected positive social change. Congresswoman Capps is committed to helping people improve their daily lives through better schools, quality health care, and a cleaner environment. She was sworn in as a Member of the 105th Congress in 1998, succeeding her late husband, Congressman Walter H. Capps. 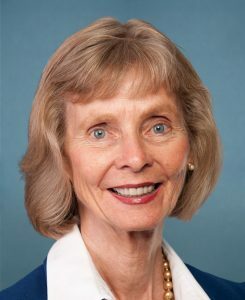 Mrs. Capps has successfully spearheaded and passed legislation specifically to: address the national nursing shortage, detect and prevent domestic violence against women, curb underage drinking, improve mental health services, provide emergency defibrillators to local communities, bring CPR instruction to schools, and improve Medicare coverage for patients suffering from Lou Gehrig’s disease. Mrs. Capps has resided in Santa Barbara since 1963. 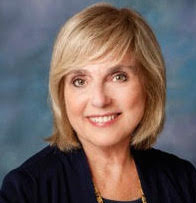 Dr. Lois Phillips has a varied background in the communications field which includes conference speaking, producing and hosting two TV programs about women’s changing roles, co-hosting DIALOGUES–an NPR radio show on KCLU about current issues, and coaching leaders in presentation skills. As founding Executive Director of Antioch University Santa Barbara Dr. Phillips worked for the University for 11 years. Later she developed her own consulting firm where she leads training seminars and strategic planning retreats, and provides coaching services to executives who wish to communicate more effectively with stakeholders and the press. In 2007 Dr. Phillips, along with publisher Mindy Bingham and producer Deborah Hutchison, founded the Santa Barbara chapter of the Association for Women in Communications, a national organization with headquarters in Springfield, Missouri. In May of 2008 the group created the Women of Achievement Awards to honor six amazing Women: Deborah Hutchison, CEO Gutsy Gals Inspire Me Animated Films, and Former Santa Barbara News-Press journalists Melinda Burns, Anna Davison, Melissa Evans, Dawn Hobbs and Jane Hulse. Other past winners of the award include Dr. Nancy Leffert, Marianne Partridge, Marsha Bailey, Paula Lopez, Perie Longo, Lynda Weinman, Starshine Roshell, Catherine Remak, and Sara Miller McCune. This entry was posted in Past Events on May 8, 2016 by Lisa.